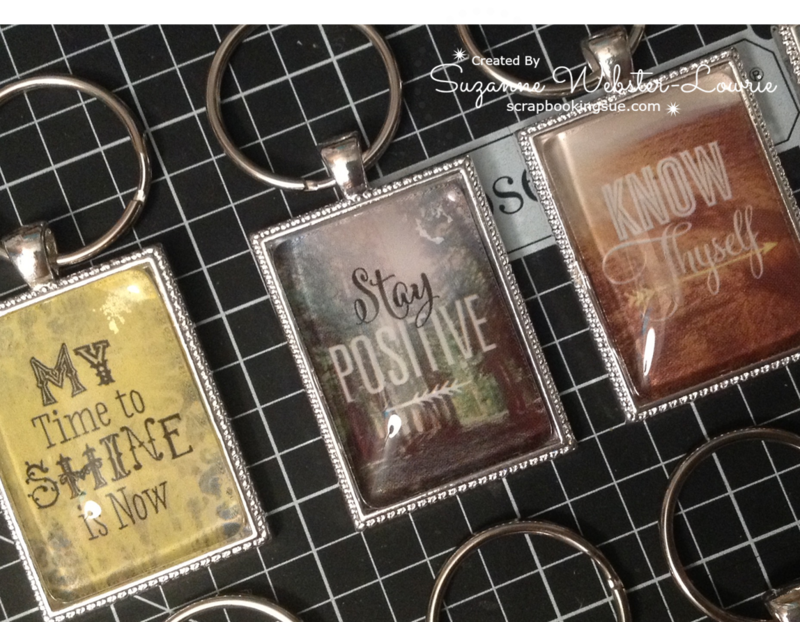 Here is another item for my upcoming craft fair… Base and Bling inspirational key chains! 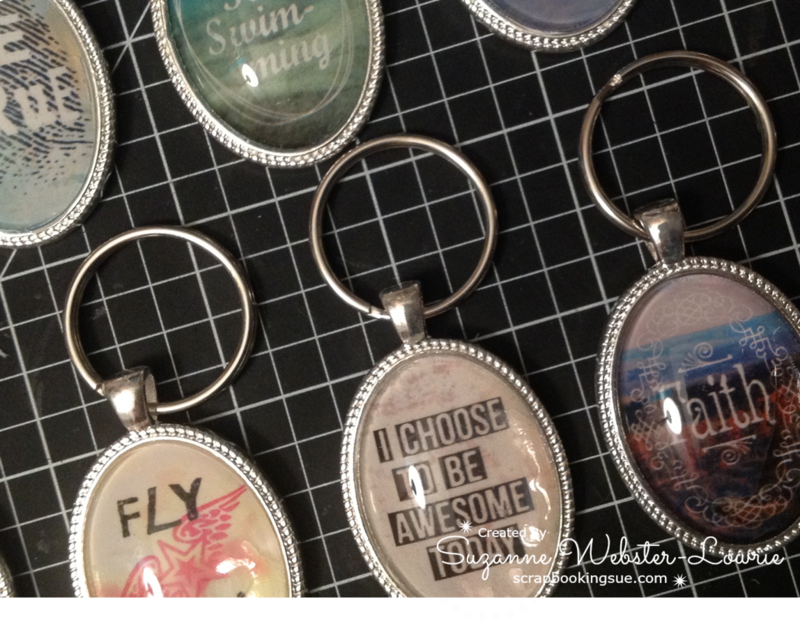 If you are familiar with the Close To My Heart Base and Bling line, then you will probably know it best as DIY necklaces. 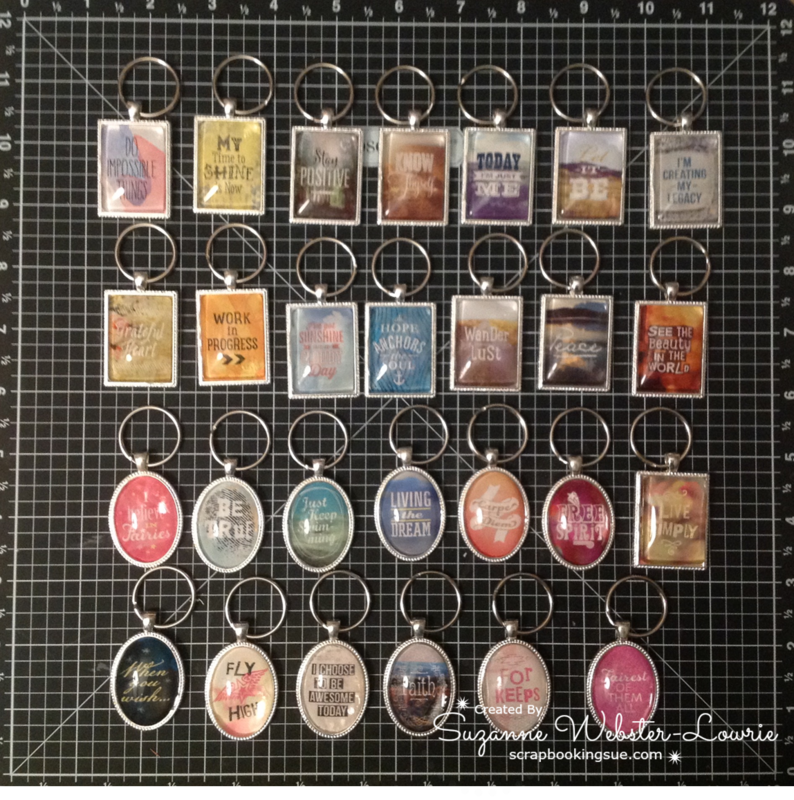 Well, a few weeks ago, I saw that a consultant had turned a couple of her items into key chains (sorry, I forgot who I got this idea from!). Select your Pendant. I used the Faux Silver Rectangle Pendant and the Faux Silver Oval Pendant. Select your image. I used inspirational images from the Journey Style Sheet. Peel and stick your image onto the pendant. Since the images on the style sheet are rectangular, they fit perfectly into the rectangle pendants. To get the oval shape, simply center an oval glass cover over your image, trace around the oval, cut it out using the inside trace lines as a guide, then peel and stick to your pendant. Push it down around the edges if you find it overlapping just a bit. Apply a small drop of Liquid Glass glue to the center of your image. Place a glass cover (rectangle or oval, depending on your pendant) into your pendant and push down to spread the Liquid Glass glue around the image. If the glue seeps out from under the glass, wipe it off immediately. The pendant is now complete. Wait a good 12-24 hours before handling the pendant, so that the glue is completely dry. Add a key chain ring to your pendant and voila… a brand new key chain! Or if you prefer, add an actual chain and make it a necklace. I packaged them very simply so that the image really stood out. All of the patterned paper headers were from retired paper packets that I had in stock. There are many more projects to come… stay tuned! Today’s festive project features a bunch of fun products from Close To My Heart! Why Christmas in October? The October Stamp of the Month: Twinkle is a Christmas-themed stamp set, so that you can get a jump on your Holiday projects! 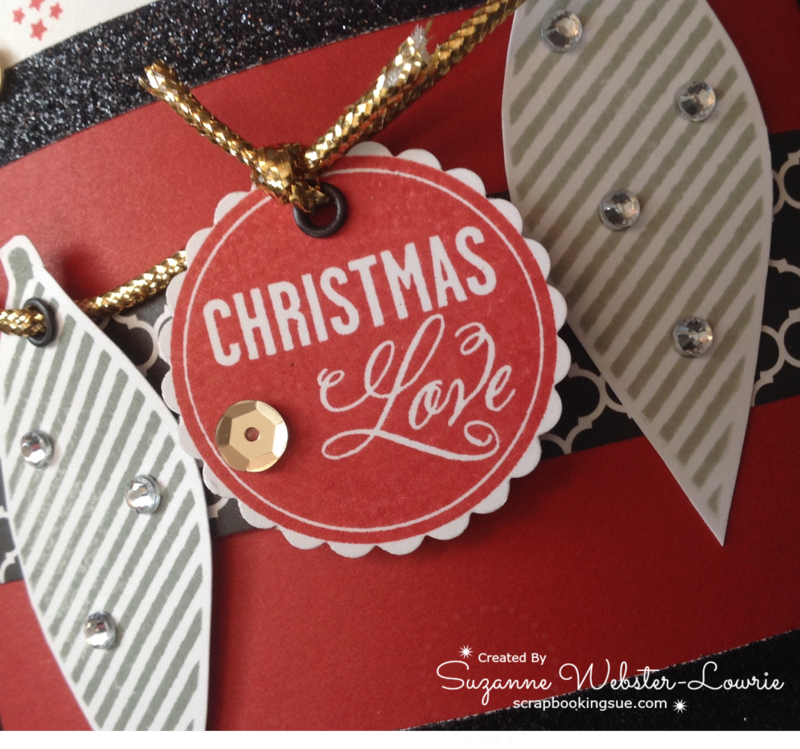 The “Christmas Love” Pillow Box was cut with the CTMH Art Philosophy Cricut Cartridge. Using the “Twinkle” Stamp Set, I stamped clusters of tiny stars in Cranberry Ink around the unassembled pillow box. Using White Daisy cardstock scraps, I stamped the holiday lights in Slate and Whisper Inks, and the sentiment in Cranberry ink. A strip of Cranberry cardstock was adhered around the center of the box, with a strip of patterned paper from the La Vie En Rose Paper Packet around it. 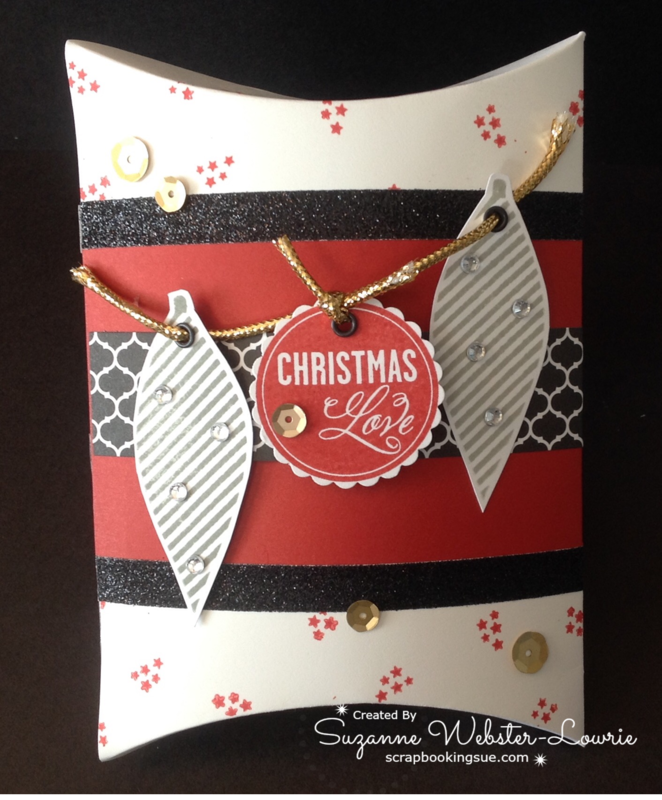 Black Shimmer Trim was attached along the top and bottom of the cardstock. Each light was cut by hand, and the sentiment was punched out with a 1.5″ scallop punch. (FYI… if I wasn’t so impatient to wait for my Cricut machine to warm up, those images could have been perfectly cut with the corresponding images on the Artiste Cricut cartridge.) I punched holes in the tops of the stamped images and attached a black eyelet to each one. I found some gold, stretchy, packaging ribbon in my stash and used it to thread through the Christmas lights, and as a topper for the sentiment tag. The lights were glued down and a couple of Glue Dots were used to keep the ribbon in place. The sentiment was attached with some foam tape to pop off the box. At this point, I assembled the box by gluing the side flap. To finish things off, I went a little overboard with the bling (is that even possible?). Gold Sequins were scattered throughout the box, and Clear Sparkles were used on the Christmas Lights. I’m feeling festive already! 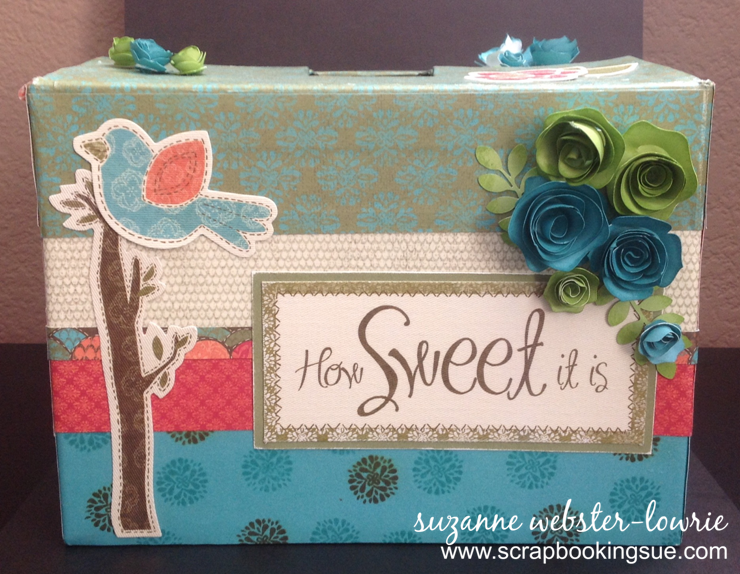 I created this draw box using a recycled Splenda box (one of the massive ones from Costco), and some pretty, patterned papers from CTMH. These papers have long been retired… I think they were called Bohemian, or BOHO. 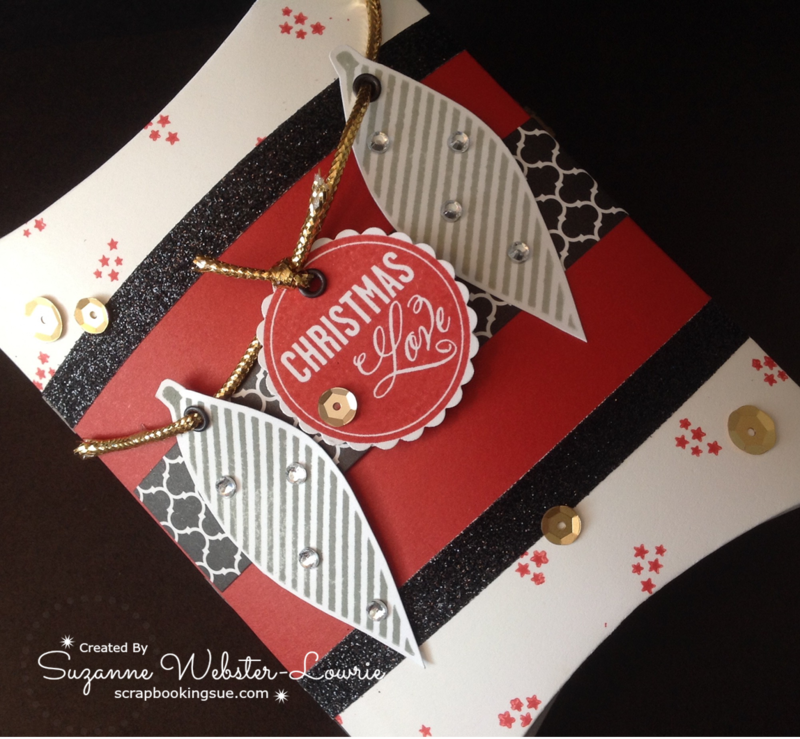 I started by random stamping on Lagoon cardstock, and they glued it around the bottom portion of the box. 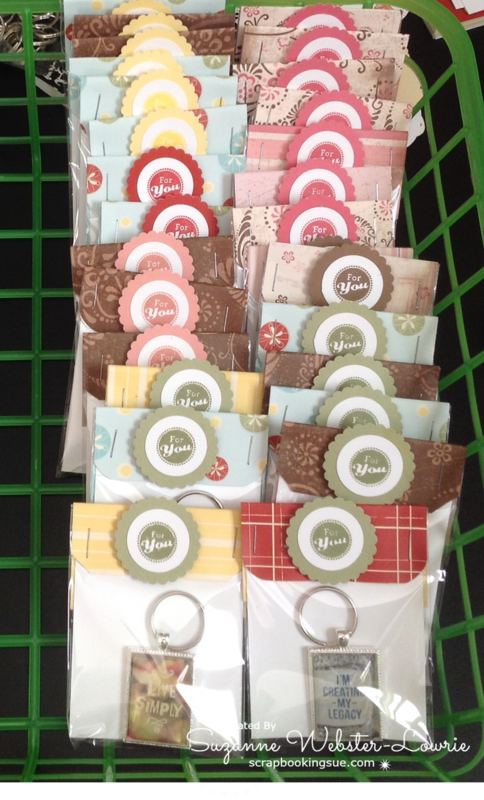 Then, I layered various patterned papers from the paper packet, until the entire box was covered. I used Mod Podge to seal the papers onto the box permanently. Those gorgeous stickers were from the Bohemian stickers pack, and they are actually made of adhesive-backed fabric! The flowers were cut with my Cricut machine and then rolled into flowery shapes. I wanted to provide a large opening for contest entry forms, but still make it easily accessible to take the forms out. I decided to go with velcro closures. Using 4 hook and loop closures, I simply stuck them into place, and Voila, my box was complete! 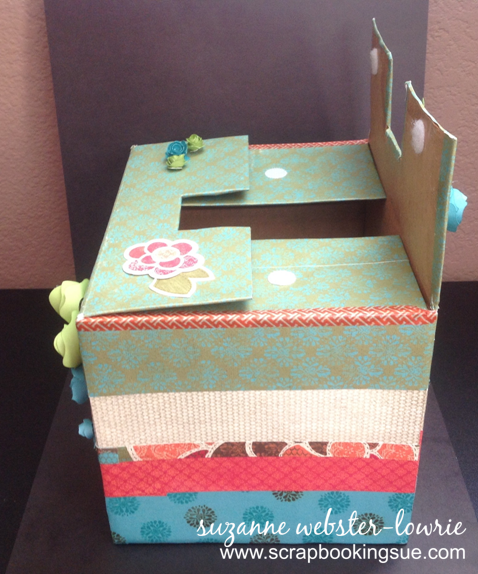 Yesterday, I posted a cute pillow box made with the Lollydoodle Paper Packet. Today, I used a different sheet of Lollydoodle paper to create this mini dotted box, also made with the CTMH Art Philosophy Cricut Cartridge. This box was cut at 4.5″ height and then folded along the score lines. I love how the patterned paper is not only double-sided, but has a pretty pattern on both sides… dots on the outside, and celebration ribbon on the inside! I tied a piece of striped-twine around the box and made a small bow. The flowers were cut free-hand from another piece of Lollydoodle paper. The smallest flower was attached to the center of the bow with a Glue Dot. The other 2 flowers were glued directly onto the box, layered one on top of the other. I just love the colors on this project! It’s like a burst of summer in the heart of winter. The Lollydoodle Pillow Box was created with the CTMH Art Philosophy Cricut Cartridge and patterned paper from the Lollydoodle Paper Packet (now retired). I simply cut the pillow box at a 5.5″ height (unassembled height) and folded along the scored lines. Striped-twine was tied around the box and knotted in the center. The flowers were cut from one of the sheets of Lollydoodle paper. There were so many adorable flowers, it was hard to choose which ones to use! To create some dimension, I adhered a large square of self-adhesive foam tape to the back of the flower and stuck it onto the box. The smaller flower was glued to the underside of the large flower, to pop off the box as well. I have been working on cute little gift boxes lately. I have a variety of boxes in different colors and occasions, but let’s start with a winter box today. The mini snowflake box was cut from the CTMH Cricut Art Philosophy cartridge at approximately a 5.5″ height (total height of the box template when open and unassembled). I used some patterned paper from the CTMH Snowhaven Paper Packet and glued it onto white cardstock to make the cut-out snowflakes really pop. The negative snowflake pieces were also used on this project. Each snowflake received a small white bling gem, and one of the smaller negative snowflake pieces had a tiny piece of thin foam tape adhered to the back to give it dimension when layered over another snowflake. A piece of white organdy ribbon was tied through the top of the box to hold everything together! I will be linking this project to the Color Dare Challenge #124, found here. This week’s challenge colors are: Glacier, Kraft, and White Daisy.